Mumbai: Currency in circulation in India stood at Rs17.78 trillion as on 16 February, reaching 98.94% of the pre demonetisation level, according to the latest data released by the Reserve Bank of India (RBI). On 4 November 2016, the latest data released by the central bank before high-value banknotes were invalidated on 8 November, the currency with the public was Rs17.97 trillion. Subsequently, it dropped to a low of Rs8.98 trillion as on 6 January 2017. 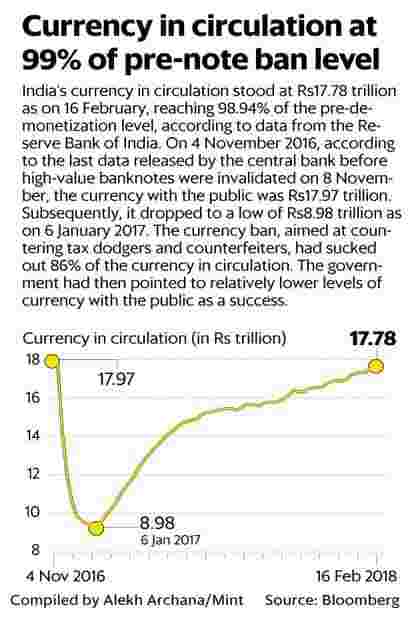 The demonetisation, aimed at countering tax dodgers and counterfeiters, sucked out 86% of the currency in circulation. The government had then also pointed out to relatively lower levels of currency with the public as a success. According to central bank’s annual report, 98.96% of notes (by value) that were invalidated had returned to the RBI by the end of June 2017.